South Korea has earmarked more than $260 million to build new railways and roads in the North, an official said Thursday, as Seoul pushes ahead with cross-border projects despite international sanctions on Pyongyang. South Korean President Moon Jae-in offered to help upgrade the North’s outdated rail and road infrastructure and connect it with the South’s in meetings this year with the North’s leader Kim Jong Un. Seoul plans to spend about 295.1 billion won ($264 million) on the schemes next year, an official at Seoul’s unification ministry told reporters, with most of it186.4 billion wongiven freely and 108.7 billion won in loans. “It is an estimate for now… we will continue efforts, including policy coordination with the US, to carry out the projects agreed between the two Koreas without a hitch,” said the official who declined to be named. Security allies Seoul and Washington agreed last week to set up a new working group to co-ordinate policy amid growing concerns in the US over Moon’s approach. The official’s comments came as a Southern lawmaker accused Seoul of ignoring UN sanctions on the North. “The US maintains the position that it would maintain maximum pressure until the North produces visible progress on denuclearisation and so does the international community including the EU,” Chung Byoung-gug told the JoongAng Ilbo newspaper. “The budget allocation by our government may make it look like our government is undermining international coordination on sanctions on the North,” he was quoted as saying. Lifting the measureswhich bans much of its trade including coal exportsis a key demand of Pyongyang’s in its ongoing denuclearisation talks with the US. 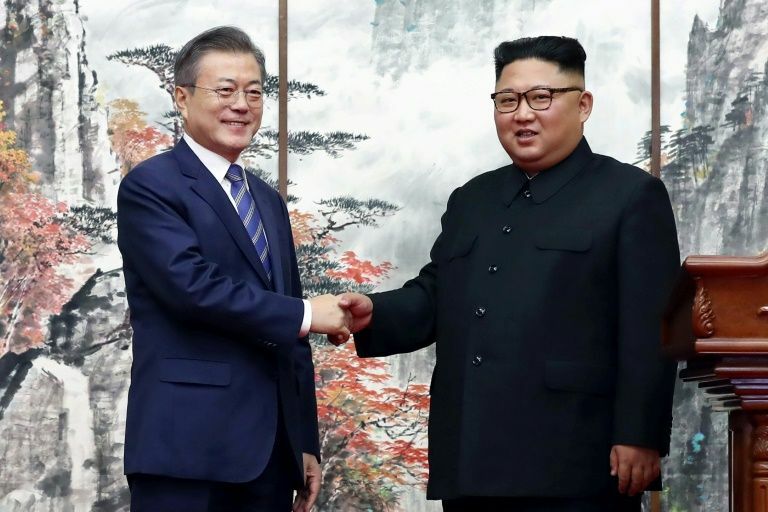 Moona dove who advocates dialogue with the North to push it towards denuclearisationhas met Kim three times so far this year and another summit is being planned in Seoul.